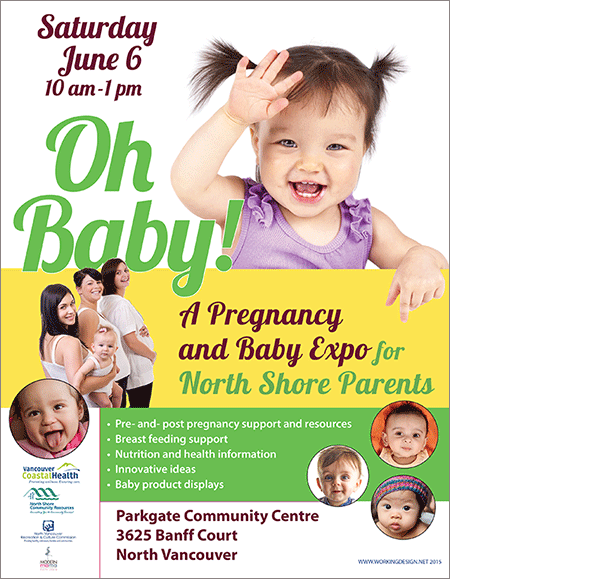 The North Shore Resources Society provides a host of services for families in North and West Vancouver. 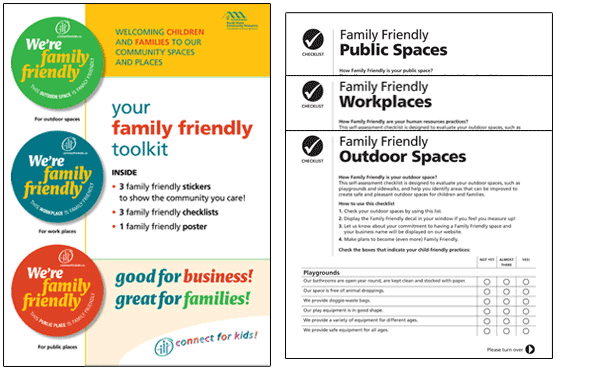 This Family Friendly campaign encourages local businesses to treat their employees well and welcome families, and children by providing basic amenities. 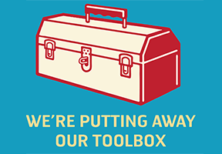 Businesses were provided with a kit and stickers to mount in their windows showing their participation. 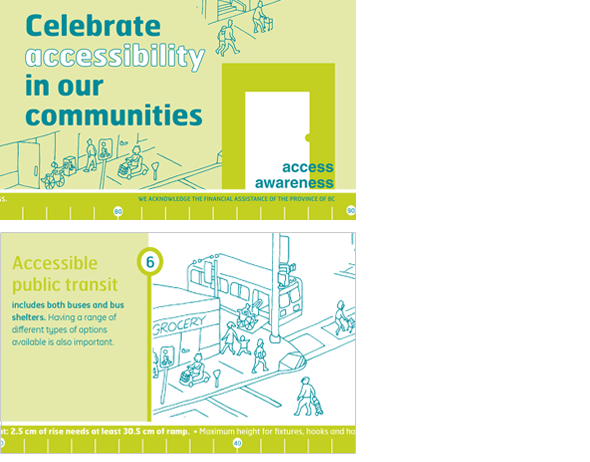 Sponsored by the Social Planning and Research Council of BC ( SPARC BC), the annual Access Awareness Day highlights accessibility issues in all environments from buildings to streets and more. This seven-panel brochure features a 36 inch / 91.5 cm measuring tape across the bottom. This represents the required width of a pathway or corridor to allow for wheelchair use. Download the PDF. 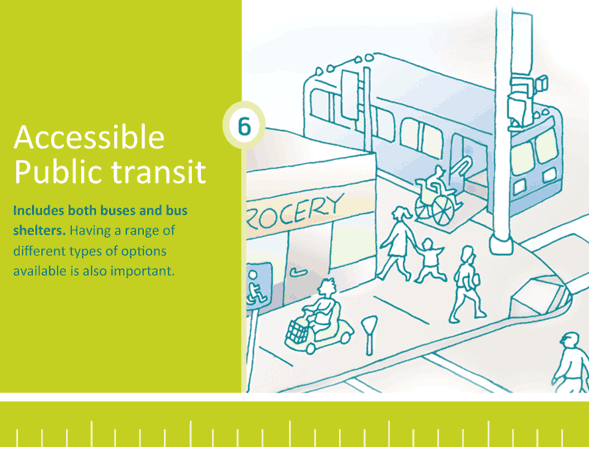 “THIS” stands for four elements needed to end poverty: transportation, housing, income and support. 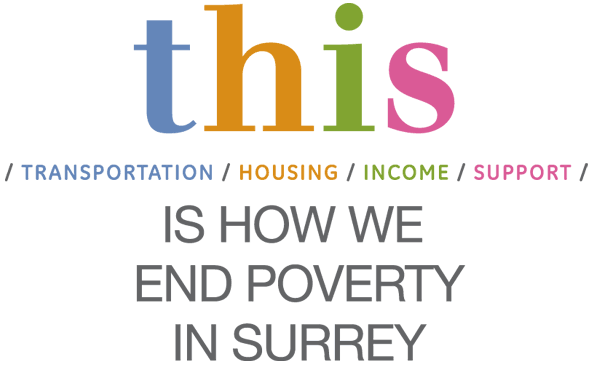 We developed this logo for anti-poverty organizers in Surrey (and our longtime client SPARC – Social Planning, Action and Research Council ) who have been working closely on this issue with support from Surrey City Council. 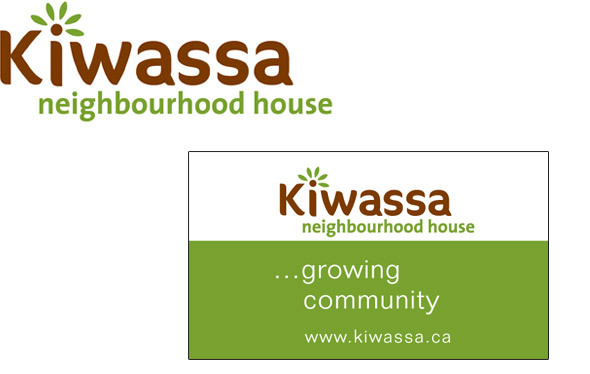 Our complete rebranding campaign for Kiwassa Neighbourhood House started with the design of this new logo. Executive Director Nancy McRitchie wanted the new mark to convey community, nature, growth and friendliness. We were more than happy to oblige. Kiwassa Neighbourhood House has been serving a diverse east side community since the late 1950’s. The website development was the core piece of an overall rebranding project that Working Design undertook with the organization. 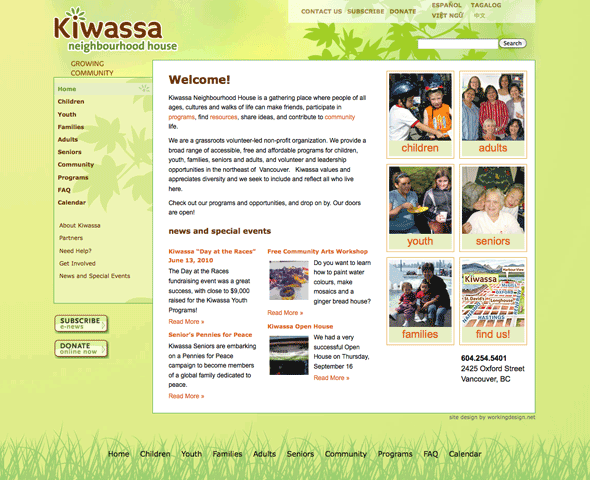 Many of Kiwassa’s users speak English as a second language. We emphasized photographs and large display buttons to encourage visitors to self-identify and quickly access the programs designed for them. 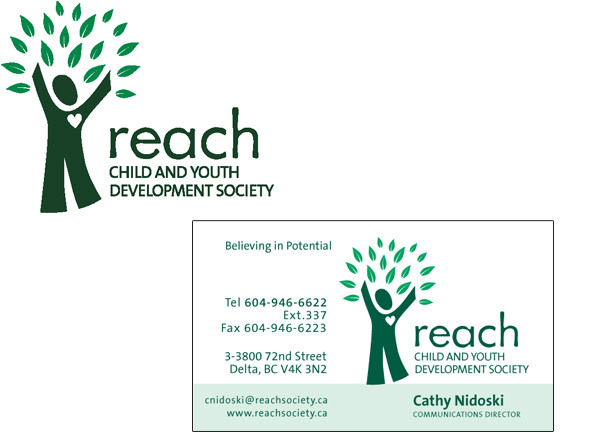 We rebranded and helped rename the REACH Child and Youth Development Society. The logo illustration by Working Designer Sam Shoicet conveys caring, growth and celebration. 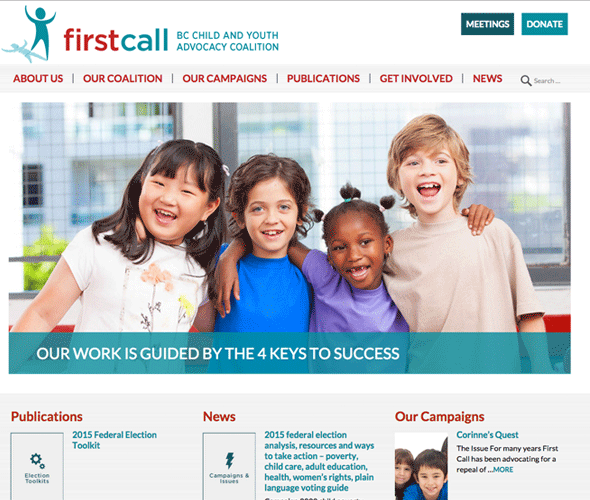 You can read a complete case study of our project with REACH. 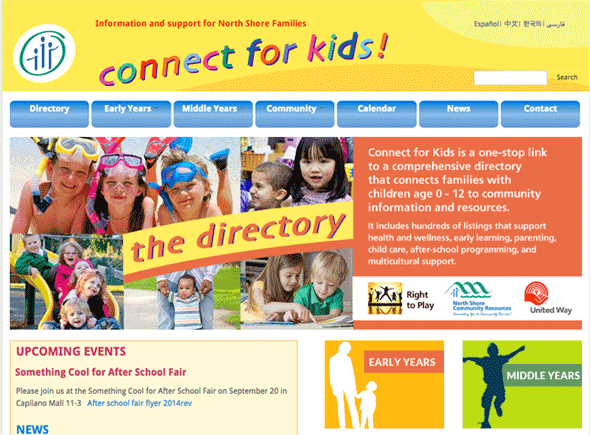 North Shore Community Services Connect for Kids is an online directory offering information and support for families with young children. It is a directory of comprehensive, searchable links that can be looked at and sorted in a number of ways, including by specific activity and age group. The home page provides news and a spotlight section for upcoming events.